40 year old Phil from Burton is a debt team manager for EON. Phil likes to keep very fit, resulting in low body fat from all the exercise and weight lifting. By doing so, Phil had lost a lot of volume from his face. Phil decided to undergo a course of Sculptra with surgeon Mr Nick Percival FRCS at Cosmetic Surgery Partners London clinic. Phil kindly agreed to give us a patient testimonial and tells us how Sculptra has helped him achieve the look he wanted. To find out more benefits of Sculptra check out our non-surgical treatments section on our website. It is also worth noting we are one of the few cosmetic surgery clinics in the UK where you can receive Sculptra treatment by the hands of fully trained and accredited cosmetic surgeons. 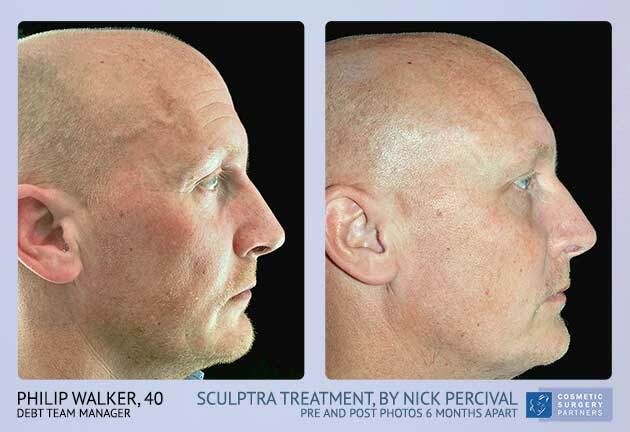 Surgeon Nick Percival concentrated on addressing the issues most pertinent to Phil's needs; widening the jaw line to give him more masculine features and adding volume in his temples and cheeks where which had a sunken appearance. Although you can already see dramatic results in Phil’s face, he should start seeing the optimal results towards the end of November. What is Sculptra treament and how does it work? The Sculptra process is gradual one which gives a more natural looking appearance without any signs of having a cosmetic procedure undertaken. As opposed to other ‘dermal fillers’ which simply get injected to plump and smooth certain areas of the face, Sculptra is a ‘bio-stimulator’.Sculptra acts by promoting the growth of the bodies naturally occurring collagen. Patients will undergo a series of treatments – an average of 3 injection sessions with an interval of 4 to 6 weeks between each session. The results of Sculptra can last for more than 2 years. 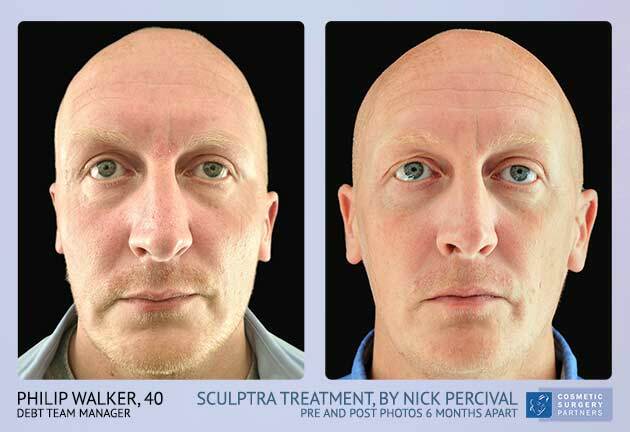 Our surgeons Miles Berry MS, FRCS (Plast) and Nick Percival FRCS are fully trained to administer Sculptra. The below video is an interview with Phil 6 months after his initial Sculptra treatment. Phil is thrilled with the results of the treatment which has granted him a new found confidence. 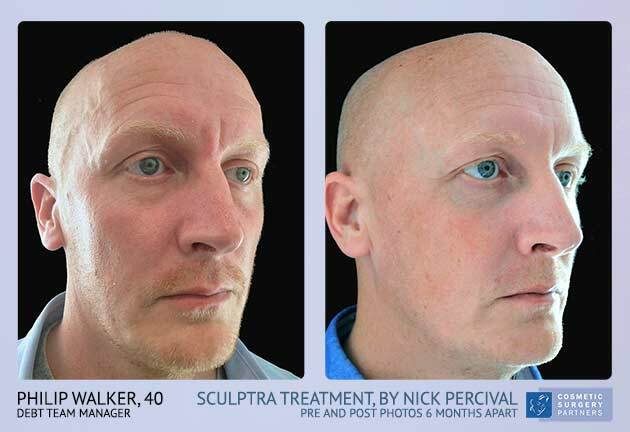 In the below video our surgeon Mr Nick Percival explains why Sculptra was the best course of treatment for 40 year old Phil. He also gives an insight into how Sculptra works and who makes a good candidate for the treatment. If you think Sculptra might be the right treatment for you why not make a booking to see one of our surgeons or give us a call today! 0207 486 6778 our highly experienced staff will be happy to answer your questions!